PLEASE MENTION THE FULL NAME AND DATE AT THE CHECKOUT IN 'MESSAGE TO SELLER' OR I CAN'T START WORKING ON YOUR ORDER. I understand that this is a time sensitive item that needs to be delivered for a certain date. I need to receive your order 10 days or more to ensure on time delivery. If you order this 7-10 days before the event, you need to add RUSH ORDER to your order, available at the checkout, so you'll receive it in time. I work on rush orders after hours and in the weekends, to guarantee on time delivery. 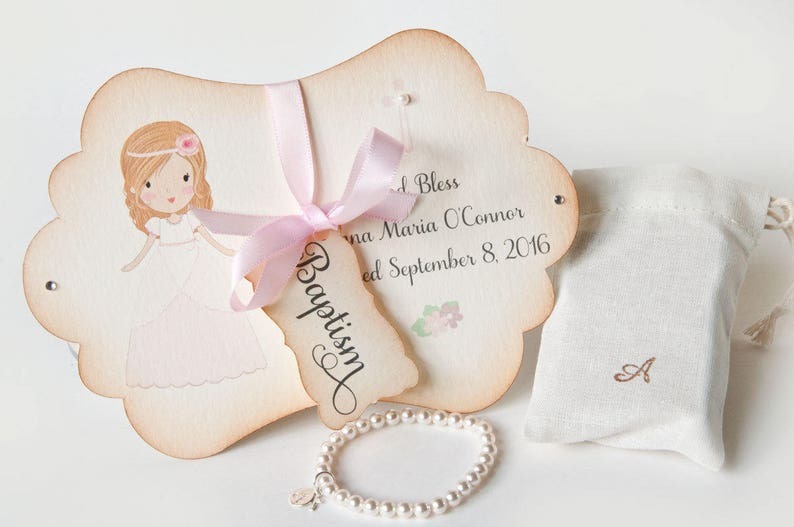 This is a listing for a little girl's pearl bracelet AND a beautiful personalized card wrapped together in a large gift box with satin ribbon. This beautiful Swarovski pearl stretch bracelet is made with 5mm perfect round off white pearls with a beautiful luster. The pearls are strung on elastic cord, so the bracelet is easy to put on and off. The TINY and delicate sterling silver cross charm is only 6mm and the monogram charm is 8mm. The monogram letter will be left clean and not oxidized. 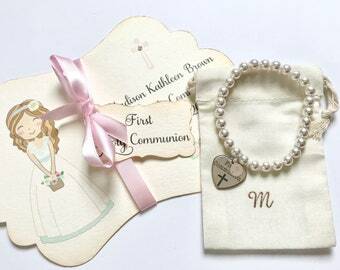 The bracelet comes in a cute little muslin bag with a monogram stamp (1 letter), in a large gift box along with beautiful handmade card. 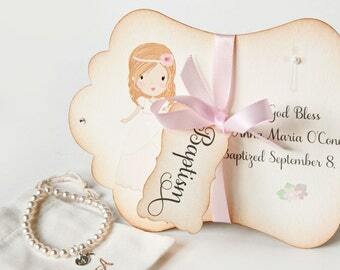 The card is made of luxe premium heavy card stock in ivory. It has been made 'vintage' by myself with 'vintage style' ink on the edges of the card. This is done by hand with sepia ink. The girl is printed on the left side of the card, with text on the right side. 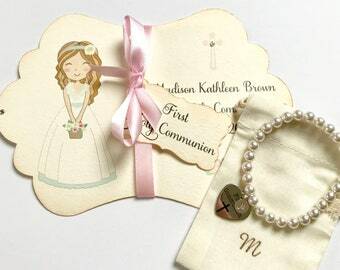 Above the text is a light pink cross, adorned with a little pearl. Below the text is a sweet little flower printed. On both sides there is a little rhinestone placed for extra sparkle. 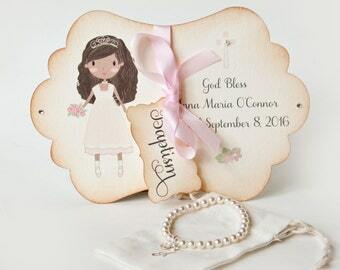 Around the card is a satin ribbon in the color of your choice, with a beautiful calligraphy wording of Baptism. This little card has also been made with vintage edges by hand with sepia ink. The card and box measure 5x7 inch and will be shipped in a flat box. If no color of satin ribbon is mentioned, I will use a pink ribbon. Card and bracelet come in ONE large gift box, no separate boxes. ALL JEWELRY AND CARDS ARE MADE TO ORDER AND THE TURN AROUND TIME IS BETWEEN 5-10 DAYS. IF YOU NEED PRIORITY MAIL, PLEASE ADD PRIORITY MAIL (WITHIN US) TO YOUR ORDER AT THE CHECKOUT. IF YOU NEED THIS BRACELET TO BE READY FOR SHIPPING WITHIN 7 DAYS, PLEASE SELECT THE RUSH ORDER OPTION (WITHIN US) AT THE CHECKOUT. so beautiful, I absolutely loved it. Just as described! Beautiful little bracelet! All jewelry will be gift wrapped and ready for gift giving. Your order can also ship directly to the recipient of the gift without an invoice, and of course gift wrapped. If you want Dutchpearl to include a note to the gift, just mention it at the checkout in 'message to seller'. All jewelry can be gift wrapped in personalized gift boxes, just mention it at the checkout in 'message to seller'.